She was raised by Maronite monks following the violent death of her mother. For thirteen years they taught her and sheltered her, serving as both guardians and family for the girl with the most acute senses, a girl hypersensitive to light, touch, sound, smell, and taste beyond that of even the most attuned mortal. But then, Chalice is not exactly mortal. Despite her abilities, she was unable to protect herself when the man came to take her. Gavin Heinrich claimed to be her father, then stole her after butchering the monks of the order in which she was raised. She became his slave, his thief. And for the twelve years since the day of her capture she's been bonded to a homicidal gargoyle and forced to do what her faux father tells her to do. Which is almost exclusively to collect precious magical artifacts from whomever owned them and turn them over to the group Heinrich works with, a dark, secretive magic sect known as the Vyantara. Somewhere among those artifacts she touches, those pieces of magic and history he sends her out to retrieve, lies the truth of her heritage. The truth of a line of warrior women, hardened by battle, almost erased by circumstance. Chalice may be a thief, but she's a thief with a destiny that, in the end, could show her a path that will ally her and her kind with angels...or see her set upon and destroyed by demons. 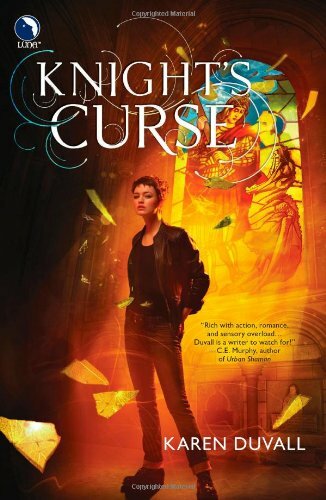 It's been a while since I was able to sink into a new urban fantasy series and get lost in an author's fantastic imagination. Sure, there are several wonderful UF series I follow and thoroughly enjoy, but there is just something special about that first glimpse, the initial introduction to characters you'll fall in love with, the first experience with a fresh voice spinning a new tale of the supernatural, paranormal, magical, and/or mystical world he or she created, that just sets my reading-addicted heart to racing. I was nearly desperate in my hope that I'd find that sort of excitement and thrilling read from Duvall's debut. Unfortunately, I can't say that I did. I loved the concept and was thrilled by the idea of the Hatchet Warriors and Saint Geraldine, but I struggled with the plot of the book and had trouble connecting to the lead character, Chalice. I felt the plot was a bit disjointed and clumsy, the narrative plodding, and it all seemed like quite a lot of trouble for not a whole lot of gain by the end. The world wasn't as fleshed out as I would've liked. I never really understood the Vyantara organization or their...mission statement, so to speak, beyond them being a group of magic collectors and dark magic users. Nor did I fully grasp Heinrich's position within that organization. I got that they were the bad guys, but they were mostly faceless and unknown. Despite the issues I had with the plot and the world building, I still would have found the book interesting had I been able to relate to or enjoy Chalice. Sadly, I can't say I did that, either. Instead I found her character hard to pin down and prone to wildly vacillating yet superficial thoughts and emotions that translated as unbelievable and unnatural. After a one-day acquaintance with Aydin, for example, she flickered back and forth between blindly trusting her new friend and possible ally, then, when it appeared he had lied, feeling deeply betrayed and hurt and riddled with disbelief. Such intense but disparate emotions after so short an acquaintance wasn't believable, and after awhile, Chalice's predilection for that sort of emotional roller coaster got downright annoying. This is a character who was raised by monks and kidnapped at the age of thirteen to be turned into a thief and a slave by a power-hungry man with megalomaniacal and homicidal tendencies. I would've thought, at the age of twenty-five, she'd be a bit more cautious and cynical, jaded by her experiences. I also would've found her more believable if she'd found a way to secure for herself some boundaries with Heinrich in the twelve years she was with him, by fair means or foul. She is so quick to rebel and fight against him now, but if that's her nature - and it seemed to be so - I kept wondering why she hadn't tried sooner. I also found her to be distressingly naive, disturbingly close-minded, and ridiculously self-involved. In that last regard, her relationship with Aydin failed to spark any sort of chord with me, and failed utterly as any sort of romantic thread. Chalice was just too wrapped up in her own agenda and needs to really see or know Aydin, as evidenced by her "solution" to a problem that comes late in the book. Chalice is so horrifyingly self-absorbed that, despite Aydin repeatedly stressing throughout the book that he and his gargoyle Shojin were friends and that he cared for him, she begs Aydin to not only let Shojin die, but to actually kill him and consume his heart to undo the change Aydin chose to undergo to save Chalice's life. Yeah...that's not my definition of love, sorry. There was potential in this book but it just didn't work for me, and I think the main character needs to be a bit more refined to be able to be sympathetic and likable. I really enjoyed Saint Geraldine - both her character and her backstory, and though I'm not sure I completely understood the angels and their roles in the big picture of the series, nor fully grasped the underlying conflict between the Vyantara and the Hatchet Warriors, I think there is still a large amount of potential for the series. I wish nothing but success for Duvall as the series continues.